Turn Your 30th Birthday Party Into A Day To Remember Forever! Let's Add Sparkle and Magic to Your Party Because You Deserve it and You and Your Guests Will Simply Love it! Turning 30 is special! So make your day extra special and worthy of remembrance! Let your 30th birthday party be nothing short of spectacular and perfect! Our mission is to decorate your birthday cake and make it look pretty, adorable and sparkling! Thick, Heavy-Duty, High-End Materials & Design – We used premium 40pt cardstock double sided glitter paper that doesn’t leave any residue on the cake or your hands! 100% Food Safe Material – Cake topper and the stand are made entirely from food-safe material! Let it touch your cake without any worries whatsoever! Exclusive Unique Design – You won’t find this 30th birthday cake topper anywhere else! It’s carefully designed right here, in the USA and it features a special, glittery design size 7" x 3.5". Perfect for the size of a regular cake or a large cupcake! This fancy 30th birthday cake topper will look awesome in all your party photos and videos! Plus, if you are not 110% happy with your purchase, just send us a message and we'll make things right! You have nothing to lose. Scroll Up, Click "Add To Cart" And Get Ready For An Amazing Party! YOU ONLY TURN 30 ONCE! - So make it a special day! Our unique 30th Birthday Cake Topper is exclusively designed in the USA and it features a special & unique design with premium quality cardstock glitter paper that leaves no trade or residue on your cake or your hands! Use it for as many photoshoots as you like and of course use it on the actual birthday party as well! FANCY CAKE DÉCOR THAT WILL BE REMEMBERED! 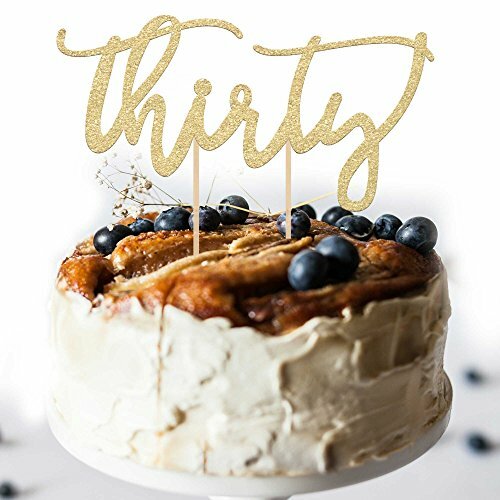 - This birthday cake decoration is made for the young man or woman who's turning 30 soon and would like to turn their birthday into a day to remember! Its generous 7" x 3.5" size is perfect for a full size round cake or a large sized cup cake! HEAVY-DUTY, DURABLE DESIGN! - We know you want everything to be perfect for your party. This is why we have made sure our THIRTY gold cake topper will not fail you! We designed it using heavy-duty, top-quality, doubled-sided 40pt cardstock paper so that it doesn't bend, twist or break in any way! PERFECTLY SAFE, FOOD-GRADE MATERIALS! - Our sparkling 30th birthday cake decoration is made with 100% food-safe materials. The glitter paper we use will never leave a trace in the food or your hands. We also use harmless, eco-friendly and nontoxic material for the construction of the stick. Just place the cake topper on your cake with zero hesitation! LOVE IT OR YOUR MONEY BACK! - Our company, Merry Expressions, stands for love and joy. That's why we want you to get in touch with us if there ANYTHING wrong with your cake topper and we'll refund every penny (or replace). If you have any questions about this product by Merry Expressions, contact us by completing and submitting the form below. If you are looking for a specif part number, please include it with your message.